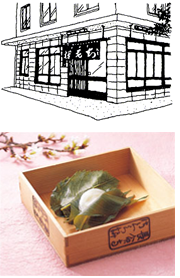 We began making and selling sakuramochi in 1717. Sakuramochi begins with a thinly fried flour shell much like a crepe. In this is wrapped a dollop of sweet bean paste, and the whole thing is then wrapped in three cherry leaves that have been preserved in salt. “Sakura” is the Japanese word for “cherry”, and it is these cherry leaves that give sakuramochi its distinctive flavor and aroma. This method for preserving cherry leaves was the creation of our founder, Shinroku Yamamoto, who collected his leaves from the cherry trees along the banks on the Sumida River, preserved them in barrels, and sold his sakuramochi in front of the famous remains of Chomeiji Temple. Then, as today, Sumida River was a famous site for viewing cherry blossoms or “sakura”, and people came from far and wide to enjoy them, and to enjoy sakuramochi as well. Visit our shop and enjoy sakuramochi on the premises, or take some home to family and friends.